So, tell me again that Eli's washed up. Nice play by Eli to move around the pocket and hit Shepard with that back shoulder pass. Eli making time with his feet... nice! Tweets reporting Quadree Henderson has a burner and is questionable to return. 2nd drive starting from our 5. Before Eli hit 3rd down pass. Its good for us . Because both 3rd down calls were. Has shurmur heard of play action. Especially when run game seems to be working. I was actually thinking to myself how much I like Spielman. I compare him to the Fox 'lead' announcer, Troy Aikman. I can't stand Aikman... Spielman adds more color and analysis to the game than Aikman ever has. There's that short slant to Beckham. I don't know why Eli can't hit a slant pass in stride? It was an underthrown lucky play. you think he threw it short by design. It was not back shoulder. ..
A score here would be beautiful! !Wentz doesn't have it today, either. There are no lucky plays, only ones that work. Too many flags in this game... I'm glad they picked this game to be sticklers on the rules. Tell us why the coaching staff and Eli himself took until November to roll out. You asked above. 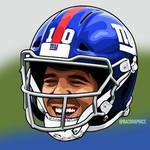 Tell you of Eli is washed up. I'll tell u this. We are never going to be a playoff contender with Eli ever again. And a game here or a few plays here too, don't justify keeping Eli for years . I guess the rumors of Rosas tweaking his leg this week were not accurate. That was a big time kick. He doesn't have years, and we'll never have him that long. Just enjoy a game where he is definitely on, and leading the guys like he used to. That's three scores, and the Eagles are a turnover=prone team.